Getting a suitable haircut for 9 year old boy can be as painstaking as it is for a grown up. Do you ever go through your childhood photos and wonder what your mother was thinking when she gave that terrible haircut. We tried to compose a short list of 5 haircuts for 9 year old boys that we consider to be timeless and fitting for almost any face shape or style. This one is a classic. 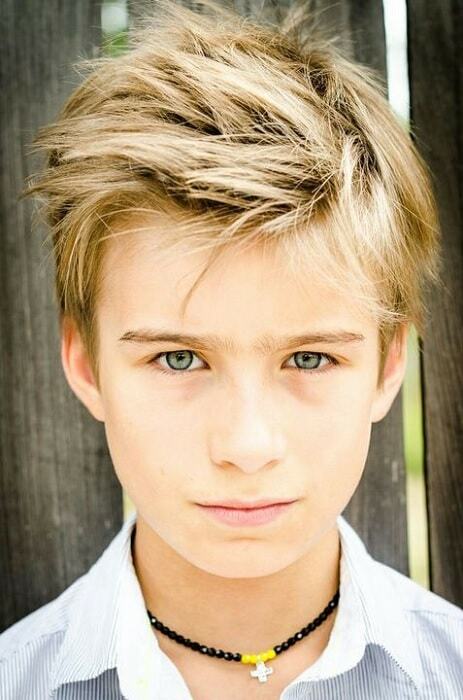 As such, it is definitely one of the best hairstyles for stylish 9 year old boys who have short hair. It is also practical. So if your boy can play sports without his hair on his face and still look. To make it stay in place, use a little bit of hair product, use your fingers to make his hair go forward, raise it up and he will be good to go. Do you ever get that feeling that you’ve always known that your little boy was a young pop star? And then he comes to you and says that he wants to look like one. Then he’ll love his hair on the top of his head swept to the side and trimmed short on the sides. If his hair gets messy easily or the occasion is a little bit more formal, you can always use a little bit of hair product to keep it in place. Whether we’re talking about men or about our little boys, a shag hairstyle is definitely among the coolest hairstyles out there. It is neat and messy at the same time. And it looks absolutely perfect for any occasion, shape or form. Just have your 9 year old boy’s haircut short on the sides and layered, and then a little bit longer on the top of his head, and then sweep it to the side while still leaving some volume and making it seem effortlessly cool. If your little one’s hair is straight and it’s been a while since he’s been to a salon, but you think that he’s long hair looks really cool, and so does he, then there is simply no reason to cut it all the way. You can just cut it a little bit shorter on the back, trim it in the front, sweep it to the side and make it sleek with just a little bit of hair product. If your little boy is a fairly simple young gentleman, this is the perfect 9 year old boy hairstyle to ask for him when you go to the salon. If his hair is straight, he’ll probably like it short and simple. It looks neat and it doesn’t require any effort when he wakes up in the morning. After a nice, long sleep his hair will still be in place and look very stylish. Save your little boys from having bad hair memories with these haircut ideas for 9 years old little boys to make their childhood stylish and memorable.